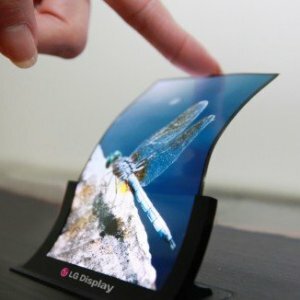 Following the commercial rollout of its first 55-inch OLED TV display earlier this year, LG has now announced that it will mass produce the world's first flexible OLED panel for smartphones. LG Display's flexible OLED panel is built on plastic substrates instead of glass. By applying film-type encapsulation technology and attaching the protection film to the back of the panel, LG Display made the panel bendable and unbreakable. The new display is vertically concave from top to bottom with a radius of 700mm. LG's flexible OLED panel is 0.44mm thin and is claimed to be the world's slimmest among existing mobile device panels. The company also claims it to be the world's lightest, weighing 7.2g even with a 6-inch screen, the largest among current smartphone OLED displays.